Music may run in the family, but Bob Dylan’s grandson Pablo seems to have taken it to an unexpected place. Newcomer to the music scene, Pablo Dylan doesn’t follow in the folky footsteps of his grandpa or the rock of his uncle Jakob, lead singer of the Wallflowers. Instead, Pablo has chosen a somewhat unexpected path: hip-hop. Bob’s rapping grandson has been popping up all over the media, from the Daily News to E! Online, shopping around his new mixtape 10 Minutes. But while Pablo’s music is a far cry from his grandfather’s legendary folk tunes of the 60s, at least the 15-year-old knows where he came from and definitely respects his roots. While the Jay-Z comparison probably sounds odd to some, Pablo’s heart seems to be in the right place. Plus, at just 15—going on 16—a young hip-hop artist is surely influenced by this decade’s mainstream media more than anything. For example, Pablo cites Eminem’s Eminem Show as the first hip-hop album that he really connected to. Pablo’s father may have also been somewhat of an influence. Jesse Dylan is famous for directing music videos by artists like Tom Petty and Lenny Kravitz, but he also worked with Will.I.Am on the video for “Yes We Can.” The Black Eyed Peas may not be as hip-hop as Eminem or Jay-Z, but it’s still a fair possibility that Pablo knows of that collaboration very well. At any rate, whether it’s the family name or the intense online promotion, it seems Pablo is taking off. He claims that 10 Minutes has already hit over 50,000 downloads (52,811 at the time of writing—including one here for AllMediaNY.com), and he’s already busy in the studio perfecting more music. Still, he also warned not to let his grandfather’s legacy be a deciding factor in his budding career. 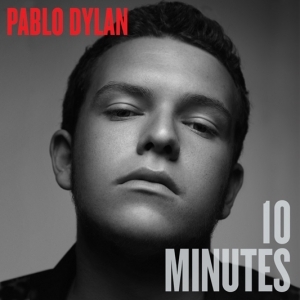 Pablo Dylan’s mixtape, 10 Minutes, is available for download through his official website.